As a perpetration to week one, Dr Dubois asked us to answer a few questions: what is dramaturgy? Have I ever done it? How? And also to mention a performance that left a big impression on me and why. I’ll start answering that by quoting Arthur miller who said that “dramaturgy is a script editor with a lot of mystification added making it impossible to do your job”. For me, as an actress/performer/practitioner, the dramaturge always seems to be the bad cop, the one who id coming to put things in order and to limit the artistic freedom in the creative process. The voice of reason, not from the heart of from the guts but from a scholar point of view. Traditionally, dramaturgy is the art of making the composition of the drama, processing the written words to a stage embodiment. Applying a set of rules on the play performance. The first set of rules presented by Aristo in his Poetics. Aristos set of rules for the well written tragedy led the way, few hundreds years later to establishing the word dramaturgy as a term and as a practice by Gothold Ephraim Lessing. (Jewish! yeah!). Lessing wrote critical and theoretical articles about the German theatre of his time in his book about the Hamburg’s dramaturgy and started a German tradition of both theory and practice theatre comes before the directing of the play and determine its ways. Lessing’s dramaturgy (classical/textual dramaturgy) wasn’t about the actual staging of a play. Berthold brechet brought a new approach to dramaturgy on the 1920s. The dramaturge was pushed out of the libraries into the rehearsal studios and they were an active members of the creative stuff. The dramaturge or the production dramaturge has become an important role in the theatre making. Since then the theatre has developed to a new way where the written word in some cases, lost its power. the post drama is having new theatrical ways of composition and communication and the work of the dramaturgy changed once again. During my studies at Tel Aviv University for my BA I was fortunate to be the student of Gad Keynar who is leading the research in the dramaturgy field in Israel, Prof Keynar’s approach proposes re-definition on the rule of the dramaturg in the post dramatic theatre. On the one hand the dramaturge has a complete freedom and his role definition is very chaotic and on the other hand he is the one who organise coherently the creative process to a performance and applying a certain order. We had to read for this session 3 short articles that suggested different definitions to the work of the dramaturg. Here are a few things I picked up. From the David Copelin text. (Which was a very angry man text). Coplein is mentioning that dramaturgs in general, “…care about themes, resonances, a plays context.” For me that is a good and accurate definition. It seems like the dramaturge’s job is to crack the mystery in the well written play. As Woddy Allen said and quoted by Copelin in the text: “ninety percent of success is showing up”. The dramaturge has some kind of ideological presence. This presence is helping to bring the stage vision come alive in the performance and help to make a relevant to audience voice be heard. Also they are”…in-house critics, process critics…”. To sum his article he wishes everyone who disagree to be dead. I understand I shouldn’t take it seriously but if you’re trying to make the reader acknowledge the importance of what you’re doing you don’t lower the level of that dissociation like that. From the Bozics article: Bozic define the dramaturg as an alien to the production process, “who maintains his or her otherness and distance from to process in order to be able to ask questions about it.” The dramaturg is an outer factor who asks the critical questions to connect between different pieces in a certain creation corpus. Bozic is the presenting a refreshing approach to the future of dramaturgy as “a dramaturgy of one’s life (how I fictionalize my own life to give it a grand narrative)…” . This is the process I did on the other module I did, Performance Lab. I tried to approach to my own life as a story as a something worth telling and explore what performance is, for me, by doing that. As Bozic conclude; “…not only life is a generator of art but art is a generator of life in a transparent way. 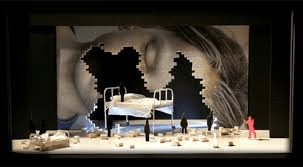 As an example to a production that left a great impression on me I chose to present the opera “The Childs Dreams” by Gil Shoat, play by Hanoch Levine. The play is based on the story of the st. Louis ship and the film “Voyage of the Dammed”. Premiered at the Israeli opera house in Tel Aviv 2010. This play is going with me wherever I go. Levine is writing the essence of life in such a clear and clever way and that is for me, what is life all about. The purpose of art is to say the things you can’t say with words and Levine is writing who I am what I am made of and where am I going. So I was very happy that Shoat, one of the most talented composers and conductor in Israel now decided to translate that to the opera medium. The music is so touching an added the play another aspect that enhanced the mimesis instead of drift that apart as musicals tend to do. The production itself managed to bring to life on stage all the metaphors Levine wrote between the lines and it was very vivid and real and touching. I’m attaching some pictures and information about that production. In order to sum that post I’d like to direct to further reading on dramaturgy as I see it today in Maakaf website. Maakaf is an online magazine for dance, theatre and performance from Israel but some of the articles are translated to English.